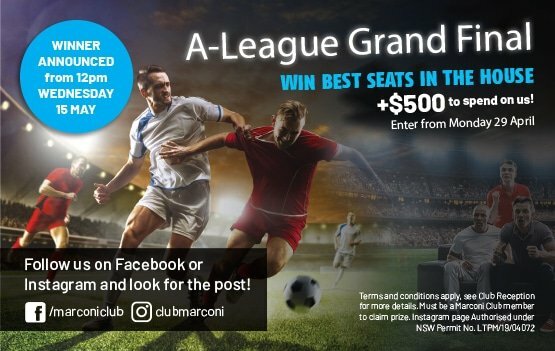 WIN THE BEST SEATS IN THE HOUSE IN FRONT OF THE BIG SCREEN + $500 TO SPEND FOR THE A-LEAGUE FINAL! To enter simply look for the Facebook or Instagram post and tag at least 3 mates in the comments! Entry is open from Monday 29 April 2019 – Wednesday 15 May 2019. Terms and conditions apply, see Club Reception for more details. Authorised under NSW Permit No. LTPM/19/04072.